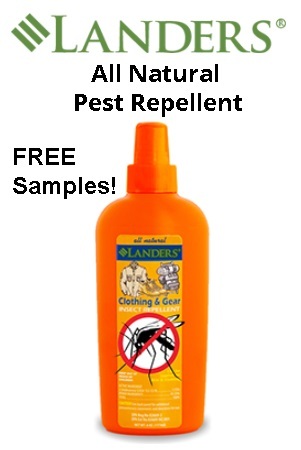 Snag a FREE sample of insect repellent from Lander’s! Unlike most other common mosquito and pest repellents, Lander’s Natural Pest Repellent contains only natural ingredients that are totally 100% harmless. Using a small amount throughout the day will keep 99% of all pests, including but not limited to, mosquitoes, horseflies and gnats. Just click the “Snag This” link now & fill out the easy form to order yours! Check out the deals on all natural insect repellent at Amazon!